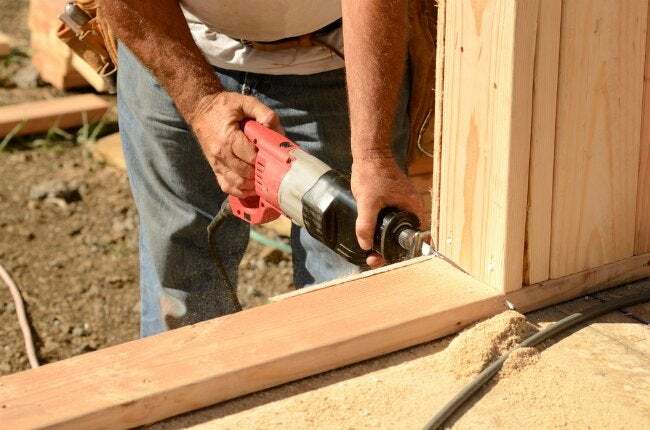 It's one of the most handy tools in the do-it-yourselfer's repertoire, but like any power tool (especially ones outfitted with a blade), the reciprocating saw demands special safety considerations. Reciprocating saws—the ones with a motor and a thin, straight blade that juts back and forth—are one of the most useful tools you can own. Reciprocating saws can cut through wood, metal, and all sorts of construction materials. But they can also be dangerous and need to be handled with the utmost care. One of the main hazards of recip saws is their potential for kickback. That can happen if you make the mistake of pulling the blade out of your cut while the blade’s still moving. The tip of the blade smacks into the material you’re cutting, and the whole saw, including the moving blade, kick back toward you. If you happen to be on a ladder, that’s especially bad news. You also need to keep in mind that the blade can bind unexpectedly. That’ll cause the blade to stop moving, but not you and the saw. Be sure to keep a tight grip. One final caution: a saw blade can generate a lot of heat, so give it some time to cool down before trying to change it.